The Sandi McCool Champions of Hope is a 5-K, 10-K and half marathon competitive race, 1-mile Spirit Walk and Kids Zone community cancer awareness event presented annually by the Southeast Health Foundation. Each year sponsors, runners, walkers, and survivors, along with their families and friends gather to raise money and awareness about the importance of early detection and intervention. Raising more than one million dollars since its inaugural event in 2008, proceeds from Champions of Hope help expand cancer services and programs offered by Southeast Health. Some of the services and programs funded include Cancer Navigation Services, 3D mammography, customized information reference binders for newly diagnosed patients, and post-mastectomy comfort kits. Each year a cancer survivor is selected as the honorary chair of the Sandi McCool Champions of Hope. Previous chairwomen include Sandi McCool (inaugural chair and event inspiration), Kelli Cundith, Kelli Hall and Franzie Bondy. It was Sandi Thurman McCool’s dream to create an event that would inspire and celebrate those who have been affected by breast cancer. Sandi wanted people to know they could receive first class medical care right here at home and Sandi knew what it meant to be at home during treatment. “I could rest better,” she said on more than one occasion. Being surrounded by her family and friends was so important and she hoped Champions would make staying at home possible for all those who are facing this diagnosis. On November 23, 2011, Sandi lost her seven-year battle with breast cancer. Sandi will always remain the inspiration and driving force behind Champions of Hope. And in 2012, as a tribute to her legacy, the event was change to The Sandi McCool Champions of Hope. 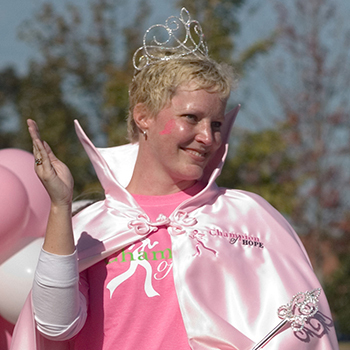 Since its inaugural year (2008) Sandi’s vision continues to grow and to date Champions of Hope has raised more than one million dollars in support of breast cancer awareness, early detection and intervention services. The Spirit Walk and 5K Race is $25. The 10K Race is $35. The Half Marathon Race is $50. The Kids Zone is FREE. Why is the 10K and half marathon competitive race more? The longer distance requires additional support to ensure the runners are safe and have adequate support to complete their race. It is typical of most races to have a higher fee for longer distances. Why is my child required to pay the same amount as an adult? All of our participants have the same registration fee no matter their age. The Kids Fit Challenge is FREE so children can participate in two events and receive our event shirt. Registration for the Kids Fit Challenge doesn’t get the little ones a shirt but there are extra shirts for sale in the Champions of Hope merchandise tent. You must be at least 10 years old to participate in the 5K/10K race. Participants of all ages are welcome to register for the Spirit Walk. I need to change my registration, what do I do? Contact the Foundation and we will assist you with the change. Parking is open and available on a first come first serve basis. What if my child won’t be 10 years old on race day? Your child can run the 5K/10K/half route with you but s/he will need to actually register as a Spirit Walk participant. To be competitive you will need to register in the 5K/10K/half event so that you will get the electronic timer and bib to receive official results. Your child will not be able receive the official timing because of his/her age. Unfortunately we cannot make exceptions to the age requirement because we are a certified route. Animals are allowed to participate in the Spirit Walk only. Please keep your dog on a leash at all times, clean up any messes and please walk at the back of the of the group. Yes, you can run with a stroller. Runners are lining up based on pace times; however, runners with strollers will need to line up in the last pace time regardless of their personal pace time. How long is the Spirit Walk? The Spirit Walk is approximately 1 mile long.